Coming Up: The Wilde importance of a spectacular Earnest. Before every Broadway show we see, Chef asks me, “Were you in this in high school?” I think he enjoys my typical refrain of “always the bridesmaid, never the bride” which is a loose translation of theatre speak for “always the character actor, never the lead.” To wit, I was not Atticus but mean attorney Mr. Gilmer in To Kill A Mockingbird, Friar Lawrence not a star struck lover in Romeo and Juliet, Sir Evelyn Oakleigh not Billy in Anything Goes. And while I’ve always adored the witty bon mots in Oscar Wilde’s The Importance of Being Earnest—a frequent selection in high school drama programs—I was glad my school never mounted a full production. I’m sure I would have been relegated to one of the relatively lackluster male parts, when what I really coveted was a role in a frock. 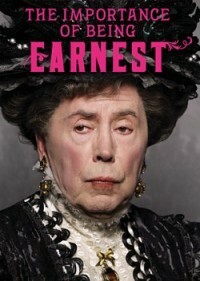 How exhilarating then to witness celebrated British actor Brian Bedford shatter that lavender ceiling for all of us character actors in his brilliant performance as Lady Bracknell, now at the Roundabout’s American Airlines Theatre. From the moment Lady Bracknell enters, I was immediately caught up in her web of pronouncements, accusations, innuendos and insults. Bedford’s comic timing is genius in its subtlety as he knows just when to punch each line, pause for effect or gesture for laughs. The sheer fact that his acting can outdo his outrageous headpieces designed by Desmond Heely is reason enough to purchase a ticket. Not only did Bedford conjure this character without her becoming camp, but also he skillfully directed the entire show—the pacing here is superb. Thankfully, Bedford doesn’t have to shoulder the weight of the production on his own. Sara Topham’s Gwendolen and Charlotte Parry’s Cecily are outrageously good as the mistakenly-in-competition love interests. Together, their comic banter makes Act II absolutely riotous. Santino Fontana’s facial expressions keep Algernon from becoming cloyingly irritating and instead remain entirely charming. My one small wish was for Lady Bracknell to fly over the audience—like a villainess in Spider-Man—just so theatregoers rushing to catch that spectacle of nonsense next door would be drawn into this magnificent production instead. As an actor and director, Bedford is shining like a super hero. Thanks to him, I’ve got another role to look forward to when I’m retired and working the dinner theatre circuit in Florida. Coming Up: Donatella's disco pizza oven might save date night. Coming Up: There’s nothing idiotic about the Green Day rock opera burning up Broadway. Coming Up: On a visit to the Morgan Library & Museum, Jon Paul discovers the consequences when a private writer’s journal becomes an open book. Coming up: Jon Paul wishes for a little more magic up Julie Taymor's Spider-Man sleeve. Coming Up: Jon Paul checks in on gal pal Mary Ann Singleton in Armistead Maupin's new Tales of the City novel.